Does Door to Door give the Runner 1 tag if the trace is unsuccessful or if the runner is not tagged? Door to Door does not give the tag if the trace is unsuccessful, but rather only if the trace is successful and the Runner is not tagged. This is mostly a flavor review. So if that's not your deal, nothing for you here. Ok fine, a little for you. Don't play Door To Door. It is a bad card. 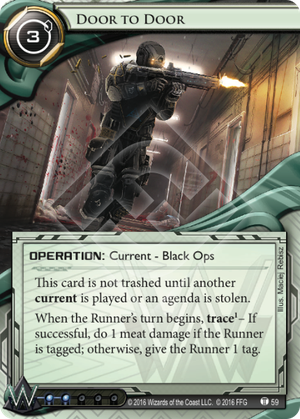 Alright, gameplay over, now time to talk about why this card is my very favorite Weyland card as far as story goes. I think it gets to the core, the very heart, of what the corp is about. Escalation is the corps at their truest. It is what they are doing when they have lost absolutely all semblance of self control, and are just expressing their core selves all over the innocent. It gets so bad that the next data pack is Intervention, followed by Martial Law. Even the Netrunner-verse Federal Government is appalled at their excesses, and gets off its rear end to reign them in. This pack is the hinge of the story, the turning point. This is where the corp crosses the line. For Weyland, that looks like this. Bloody hallways and no actionable intel. So, the picture of the card and the name combine together to give you a pretty clear idea of what is going on. Weyland has sent Prisec into civilian residences to kill their way to a solution. It is utterly despicable, eminently low tech, and entirely ineffective. In other words, it is Weyland. Picture the situation that led up to this. Weyland got robbed. Someone (Omar Keung: Conspiracy Theorist ) figured out the weakness (Corroder ) in their invincible ice and stole everything. Now they are trying to fix this. And their answer to the world's greatest hack is to hand a gun to some guy, and tell him to go out there and shoot people until someone tells them where the runner is. If they learn that, they should call the tag in, then go to that place and keep shooting people, hoping to wing the runner. THIS IS A CURRENT. Weyland will run this plan forever. There is never a point at which, left to their own devices, they will think "hmm, that's enough gun murder". Unless something stops them Weyland will send goons into apartment buildings until they run out of goons or buildings. Weyland has only three currents at present. This at 3 is the most expensive of them. Housekeeping and Paywall Implementation have both been in the meta for a while now. Paywall is a nice econ card given that weyland isn't always great at stopping runs outright, might as well pull a credit from it when you can. Housekeeping is almost like an extra taxing ice given that every time the runner wants to add to their rig they're putting another card draw in the heap. Click compression is nice but really that's a Hass trait more than anything. If you're already rigshooting it's not a bad addition but it won't kill programs outright just give them an earlier excuse to levy. Enter Door to Door. Weyland has needed better tagging options for ages. The weyland kill package has made the rounds of every other faction and finally might come back home. Since Prisec came out last pack the options for reflexive periodic tagging have increased. This is a taxing tag and not an operational one like Hard-Hitting News but it can still force the runner into some hard choices about their clicks. Also it's nice that it doesn't stop once the tag is on, it keeps shooting every turn. Downside on this is that Weyland doesn't help with traces very well. This is a low power trace which is going to cost you money on any runner with at least 1 link. And Weyland's biggest source of recurring credits The Root doesn't allow for trace spending. This makes it a cheaper in faction City Surveillance without a trash cost. Logically the runner is going to pay the 1. It's cheaper to keep paying that 1 cred until you can steal an agenda than it would be to clear the tag. Maybe this calls for pairing with something oddball like DNA Tracker to clear out loose credits but I think weyland is still going to need to borrow heavily from NBN for trace ice like Data Raven making bigger ticket purchases out of the picture.